No. 9 UVA (16-4) hosts in-state rival Virginia Tech (16-5, 5-4 ACC) in the Commonwealth Clash on Wednesday, Feb. 1. Tipoff at John Paul Jones Arena is set for 8 p.m. on the ACC Network. The game is sold out. 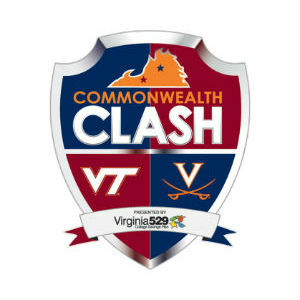 The Virginia-Virginia Tech game is part of the Commonwealth Clash presented by Virginia529, which is a head-to-head, points-based competition between the athletic teams of the Cavaliers and Hokies. UVA is 8-2 at home and has won eight of the last nine games against Virginia Tech. The Cavaliers rank first nationally in scoring defense (53.7 ppg) and second in turnovers per game (9.7). London Perrantes leads UVA in scoring at 11.9 points per game, marking the lowest scoring average to lead any UVA team in a single season (Malcolm Brogdon 12.7 ppg in 2013-14). Ty Jerome is averaging 11.5 points and 19 minutes the past two games. Jerome had a career-best 15 points at Villanova (1/29/17). UVA has the eighth-toughest remaining schedule according to ESPN’s College Basketball Power Index. The Virginia-Virginia Tech game will be televised on the ACC Network, streamed online on ACC Network Extra and broadcast on the Virginia Sports Radio Network, VirginiaSports.com and Virginia Athletics mobile app on iTunes or Android. Virginia: Tony Bennett (Green Bay, 1992), 181-76 in eight seasons at UVA and 250-109 in 11 seasons overall. Virginia Tech: Buzz Williams (Oklahoma City University, 1994), 47-42 in three seasons at Virginia Tech and 200-128 in 10 seasons overall. The Commonwealth Clash encourages a friendly, statewide rivalry between the two schools across all school-sponsored sports with 22 individual event points on the line. The school that accumulates 11.5 points or more will be crowned the winner and take home the Virginia529 Commonwealth Clash trophy. The UVA-VT game is worth a half point in the Clash and the Cavaliers lead this year’s Clash 5-4.5. UVA has captured the Clash in each of the past two seasons. As of Jan. 30, UVA ranks first nationally in scoring defense (53.7 ppg), second in turnovers per game (9.7), seventh in assist-to-turnover ratio (1.55), 10th in field goal percentage (49.6%) and scoring margin (+15.5), 12th in field goal percentage defense (38.7%),16th in 3-point field goal percentage (40%) and turnover margin (+3.8) and 18th in fouls per game (16). UVA has held four opponents to fewer than 40 points and was the first team in Division I to hold three straight opponents (St. Francis Brooklyn, Yale and Grambling State) to fewer than 40 points in the last 20 years. UVA was also the first team in ACC history (1953-present) to hold three straight opponents to fewer than 40 points. The Cavaliers have held 13 of their opponents to 54 or fewer points and six opponents to 50 or fewer points. UVA is ranked No. 9 in the latest AP poll and No. 11 in USA Today Coaches’ poll. UVA has ranked in the top 15 in 56 of the last 58 AP polls. UVA was ranked in top 10 in the preseason rankings (No. 8/7) for the third straight season, matching a school-best from 1981-83. UVA has been ranked in 59 consecutive AP polls since Feb. 3, 2014. UVA has finished in the top 10 (No. 3 in 2014 & No. 6 in 2015 and No. 4 in 2016) in the final AP rankings in three consecutive seasons for the first time since 1981-83. Virginia is 89-54 all-time vs. Virginia Tech in the series that dates back to 1914-15. UVA and VT split two meetings last season as the Hokies defeated the Cavaliers 70-68 in Blacksburg before Virginia posted a 67-49 win over Virginia Tech in Charlottesville. The Cavaliers are 37-12 against Virginia Tech in Charlottesville, including a 7-3 mark at JPJ. UVA has a four-game winning streak against Virginia Tech at JPJ. Head coach Tony Bennett is 10-4 all-time vs. Virginia Tech. London Perrantes has averaged 10 points in six career games against the Hokies, including 14 ppg in two games in 2015-16. Anthony Gill tallied 16 points and Isaiah Wilkins chipped in a career-high 14 points to lead then-No. 7 Virginia to a 67-49 win over in-state rival Virginia Tech at John Paul Jones Arena on Feb. 9, 2016. Two-time All-American Malcolm Brogdon added 12 points and Mike Tobey had 10 points. Justin Robinson led the Hokies with 16 points, while Chris Clarke had 11 in his first action for the Hokies since breaking his right foot in late December of 2015. Virginia Tech’s top two scorers, Zach LeDay and Seth Allen, were limited to seven and six points, respectively, as the pair combined to make only 4 of 16 shots from the field. The Cavaliers scored 21 points off of 15 Virginia Tech turnovers. UVA limited the Hokies to 35.6 percent field goal shooting. Donte DiVincenzo’s tip-in at the buzzer gave then-No. 1 Villanova a 61-59 win over then-No. 12 Virginia at Wells Fargo Center in Philadelphia on Jan. 29. Ty Jerome led the Cavaliers with a career-high 15 points, including a game-tying runner with 15 seconds left before DiVincenzo’s tip-in of a Josh Hart missed layup. Jalen Brunson and Mikal Bridges each scored 15 points for the Wildcats. UVA held Villanova stars Hart and Kris Jenkins to 12 and eight points, respectively. Marial Shayok tallied 14 points and Isaiah Wilkins added 12 points and a game-high eight rebounds. Villanova out-rebounded Virginia 25-24 and made 20 of 24 free throws compared to 3 of 3 for the Cavaliers. UVA shot 50 percent from the field and suffered its first loss since Dec. 7, 2013 (at Green Bay) when shooting 50 percent or better. UVA is led by senior point guard London Perrantes, who is averaging team highs in points (11.9 ppg) and assists (3.9 apg). Isaiah Wilkins (7.1 ppg & 5.9 rpg) leads the team in rebounding, blocked shots (26) and steals (25). Devon Hall is averaging 8.2 points and 4.2 rebounds, while Darius Thompson has added 7.0 points per game. Marial Shayok is averaging 10.2 points and Kyle Guy is averaging 7.8 points to top all UVA rookies. Jack Salt is averaging 4.2 points and 3.8 rebounds in 19.6 minutes per game after averaging 1.6 points and 1.1 rebounds in 6.6 minutes per game last season. Ty Jerome is averaging 11.5 points on 69.2 percent shooting, including 55.5 percent (5-9) from 3-point range, the past two games. Mamadi Diakite and Jarred Reuter are role players off the bench. No. 9 Virginia travels to Syracuse for an ACC tilt on Saturday, Feb. 4. Tipoff at Carrier Dome is set for Noon on ESPN2.